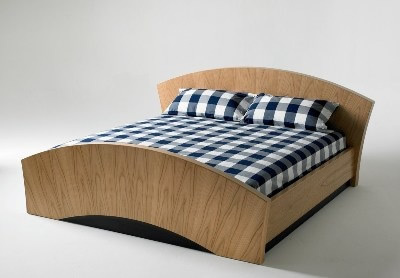 Irenic is a Greek word that means fitted or designed to promote peace; pacific; conciliatory; and is calm.This description aptly defines the design of the Irenic Bed, because of its underlying intent to weave together. Many divergent elements into a holistically balanced and restful whole. The overall dimensions and proportions of this bed are conducive with ancient Feng Shui texts, for attracting wealth, harmony and balance into one's life. Inlaid into the face of the headboard (and located discretely behind the pillows) is a small ovoid shaped stone, known as a Narmadeshvara Shiva Lingam. This is a Hindu sacred stone that has been ceremoniously gathered once a year from the muddy banks of the Narmada River, one of the 7 sacred holy places of pilgrimage in India. This stone has been naturally formed and is made of a mineral called Crypto Crystalline Quartz. To those who follow the Tantric tradition, Shiva Lingams represent the enlightenment of the whole body and symbolize the perfect balance of Male and Female energy. Each bed is individually crafted on a bench by hand, and is numbered, dated and signed by the craftsman. John Wiggers is an award winning studio furniture maker. John�s passion for woodworking has been life-long and much of his knowledge has been learned from his father Johan, who was himself trained as a master craftsman in his native country of Holland. In addition to this, John�s furniture making skills have also been honed through many years of collaboration with some of the world�s most renowned furniture designers and makers, including OEM (private label) work for talents such as J. Wade Beam, Dakota Jackson, Vladimir Kagan, Ron Seff, and Lee Weitzman. The spirit of John�s work reflects his deep philosophical commitment to environmental responsibility and sustainability. In the late 1980s John became an active early supporter of grass roots initiatives such as W.A.R.P. (Woodworker�s Alliance for Rainforest Protection). Together with Greenpeace, The Sierra Club and World Wildlife Fund, W.A.R.P. later went on to play a key role in the formation of the Forest Stewardship Council (FSC) in 1993. In 1998 John became one of the first furniture makers in the world to be certified by the Smartwood arm of Rainforest Alliance to the rigorous chain-of-custody standards of the FSC.